Learn more about our seamless gutters! At Bruce Andrews Seamless Gutters LLC we install seamless gutters in aluminum or copper. Our seamless gutters are created on-site by our qualified professional staff to ensure there is no possible leaks in your seamless gutter system. Since there are no seams, there isn’t any leaks. This is why they are the most popular type of gutter today. 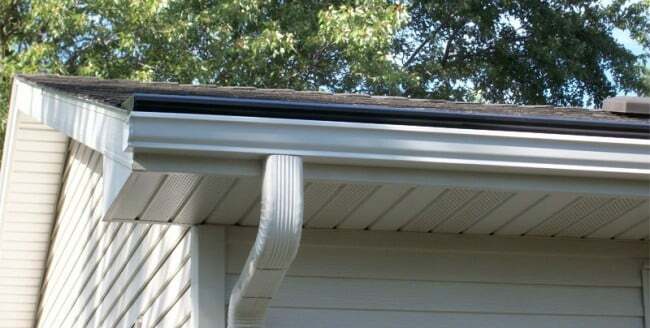 The only seams within the entire seamless gutter system are at the inside and outside corners. The Seamless Gutter itself is continuous which makes them both durable and aesthetically more appealing. Many of the seamless gutter systems are made out of aluminum, although we also make them from copper. We make them with a seamless gutter machine that we bring to your home and each section of gutter is customized to fit your home perfectly. What happens if I choose to NOT go with a seamless gutter system? There are a wide variety of gutter materials to choose from, including steel, aluminum, vinyl, copper. Many types of gutters (steel and vinyl are the most common) are available at your local hardware store. The problem is that they require dozens of seams fastened with slip fittings and each seam is a potential water leak waiting to happen. With your common sectional gutter systems, there are many sections of gutters all pieced together by snap-in-place connectors and other fastening systems. Over time these gutter sections can form weak areas in the seams and can cause water leaks that lead to wood rot behind the gutter system. Seamless Gutters are widely recognized as the desirable type of gutters that one can choose to be professionally installed on your home. Seamless Rain Gutters and Continuous Rain Gutters are both commonly referred to as Seamless Gutters.